Alright, I’ve pulled the April Fools day trick on here a few times over the years. That gets old. I’ll leave you up to find some tricks out there. In other news, every year ThinkGeek offers some radical products. All of them are fake, but usually pretty damn cool. In fact, last year they introduced the 8-bit tie as a joke. After many requests they actually ended up producing it. Hah! Check it out. 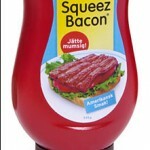 This year, my personal favorite is the Squeez Bacon… I’m hoping we can all unite and rally for the production of this… Just think how amazing that would be? 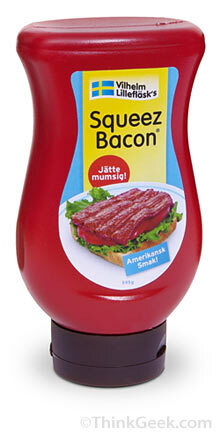 For only $7.99 you could squeeze out some bacon onto anything you desire! Check out the rest of today’s products by visiting their front page. All featured products are fake.